Are you one of those people with a house overrun with yarn? Don’t know what to do with all those stacks of magazines? 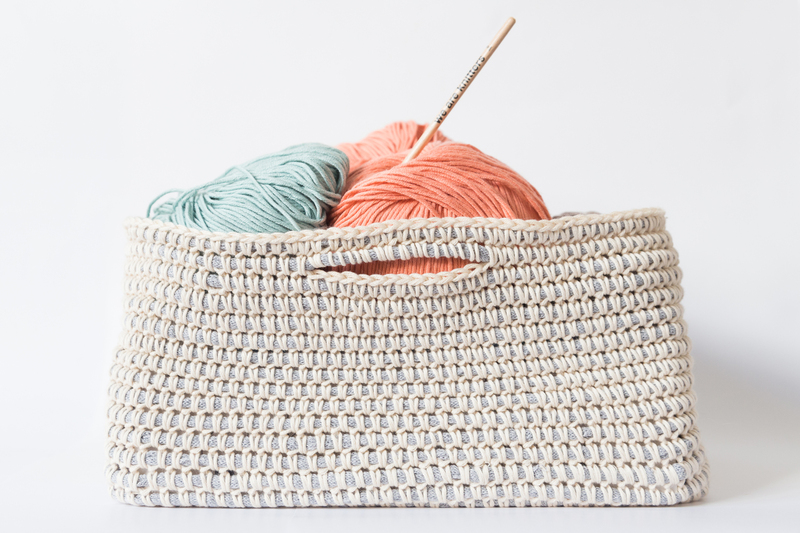 Today in the blog we give you the solution to your problems, teaching you to crochet this practical cotton basket. –1 skein of The Tape in the color grey Divide the skein into two small skeins of the same size. 1.Chain 20 + 1 extra with your crochet hook. *ATTENTION! In this pattern we are going crochet wrapping the double strand of The Tape with the cotton thread. It will catch The Tape, wrapping it so that it is on the inside. single crochet 18 and single crochet 5 into the last stitch. You will have a total of 48 stitches. Row 2: single crochet 20, single crochet 3 into the same stitch, single crochet 2, single crochet 3 into the same stitch, single crochet 20, single crochet 3 into the same stitch, single crochet 2 and single crochet 3 into the last stitch. You will have a total of 56 stitches. Row 3: single crochet 21, single crochet 3 into the same stitch, single crochet 4, single crochet 3 into the same stitch, single crochet 22, single crochet 3 into the same stitch, single crochet 4, single crochet 3 into the same stitch and single crochet 1. You will have a total of 64 stitches. Row 4: single crochet 22, single crochet 3 into the same stitch, single crochet 6, single crochet 3 into the same stitch, single crochet 24, single crochet 3 into the same stitch, single crochet 6, single crochet 3 into the same stitch and single crochet 2. You will have a total of 72 stitches. Row 5: single crochet 23, single crochet 3 into the same stitch, single crochet 8, single crochet 3 into the same stitch, single crochet 26, single crochet 3 into the same stitch, single crochet 8, single crochet 3 into the same stitch and single crochet 3. You will have a total of 80 stitches. Row 6: single crochet 24, single crochet 3 into the same stitch, single crochet 10, single crochet 3 into the same stitch, single crochet 28, single crochet 3 into the same stitch, single crochet 10, single crochet 3 into the same stitch and single crochet 4. You will have a total of 88 stitches. Row 7: single crochet 25, single crochet 3 into the same stitch, single crochet 12, single crochet 3 into the same stitch, single crochet 30, single crochet 3 into the same stitch, single crochet 12, single crochet 3 into the same stitch and single crochet 5. You will have a total of 96 stitches. Row 8: single crochet 26, single crochet 3 into the same stitch, single crochet 14, single crochet 3 into the same stitch, single crochet 32, single crochet 3 into the same stitch, single crochet 14, single crochet 3 into the same stitch and single crochet 6. You will have a total of 104 stitches. Row 9: single crochet 27, single crochet 3 into the same stitch, single crochet 16, single crochet 3 into the same stitch, single crochet 34, single crochet 3 into the same stitch, single crochet 16, single crochet 3 into the same stitch and single crochet 7. You will have a total of 112 stitches. Row 10: single crochet 28, single crochet 3 into the same stitch, single crochet 18, single crochet 3 into the same stitch, single crochet 36, single crochet 3 into the same stitch, single crochet 18, single crochet 3 into the same stitch and single crochet 8. You will have a total of 120 stitches. Row 11: single crochet 29, single crochet 3 into the same stitch, single crochet 20, single crochet 3 into the same stitch, single crochet 38, single crochet 3 into the same stitch, single crochet 20, single crochet 3 into the same stitch and single crochet 9. You will have a total of 128 stitches. Reinsert the hook and single crochet 52 stitches more. Repeat from * to *. Single crochet the remaining 48 stitches to finish the row. Row 27: single crochet… and done! You have finished and made your cotton basket! You can use it to store your yarn, to organize your magazines or even use as a fruit bowl! The possibilities are endless..